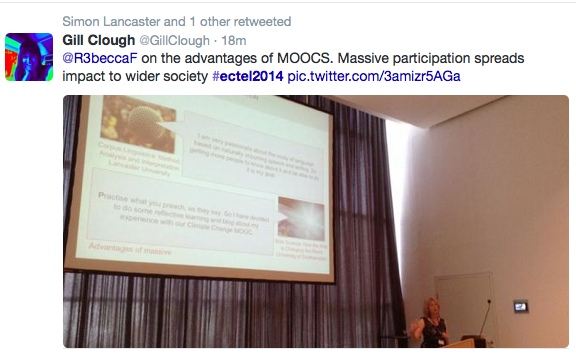 Mike Sharples and I presented at EC-TEL 2014 in Graz on Innovative Pedagogy at Massive Scale: Teaching and Learning in MOOCs. We examined the implications for pedagogy of education at a massive scale. Educational approaches designed or adapted to be effective for large numbers of learners include direct instruction, networked learning, connectivism, supported open learning, and conversational learning at scale. We used a grounded approach to analyse data from 18 MOOCs run on the UK-based FutureLearn platform. This enabled us to identify benefits and challenges for learners, for educators and for society as a whole of learning at massive scale. These need to be addressed in two ways, through learning design and through platform design. After our presentation, Yishay Mor interviewed us about it for the Open Learning Europa website. Also at the conference, I presented a poster co-authored with Denise Whitelock, ‘Taking on different roles: how educators position themselves in MOOCs’. Educators in massive open online courses (MOOCs) face the challenge of interacting with tens of thousands of students, many of whom are new to online learning. 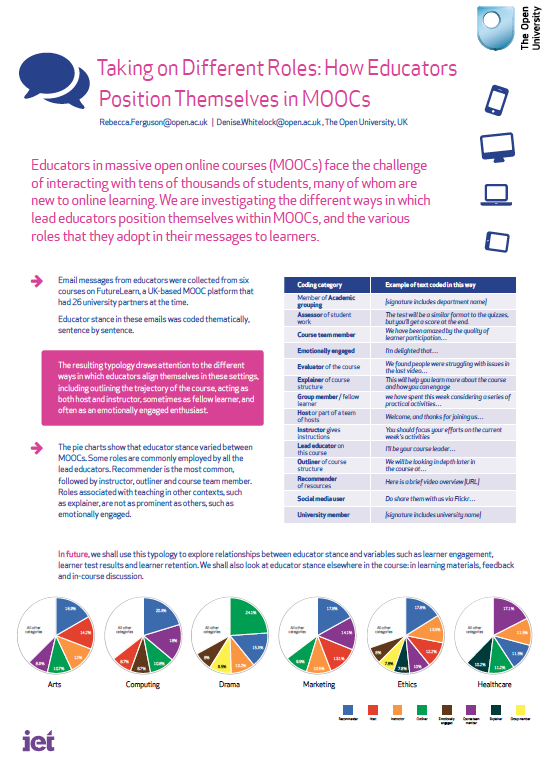 This study investigates the different ways in which lead educators position themselves within MOOCs, and the various roles that they adopt in their messages to learners. Email messages from educators were collected from six courses on FutureLearn, a UK-based MOOC platform that had 26 university partners at the time. Educator stance in these emails was coded thematically, sentence by sentence. The resulting typology draws attention to the different ways in which educators align themselves in these settings, including outlining the trajectory of the course, acting as both host and instructor, sometimes as fellow learner, and often as an emotionally engaged enthusiast. This typology can be used to explore relationships between educator stance and variables such as learner engagement, learner test results and learner retention. This entry was posted on November 12, 2014, 8:21 pm and is filed under Analytics, Conferences, FutureLearn, MOOCs, Papers, Posters, Presentations. You can follow any responses to this entry through RSS 2.0. You can leave a response, or trackback from your own site.